so today i shall tell you about things of great comfort. the first is susanna clarke's jonathan strange & mr norrell, a novel that came out (to fairly widespread acclaim) in '04 but somehow remained under my radar until last week. reviewers are fond of calling it 'harry potter for grown-ups,' but that's not quite right: it's more like jane austen for philip pullman fans, with a hearty dollop of neil gaiman on top (as far as i can tell, ms. clarke is a protege of his). it's the fussy-in-a-good-way story of two gentlemen, circa 1800, who re-popularize practical english magic. the style (scholarly footnotes and period diction) and subject (faerie) teeter right on the edge of twee, but clarke stays on the good side. check out the reviews on her site, or over at amazon; this is solid middlebrow stuff, and it's a hell of a lot of fun. i wish i'd passed over the mass market edition for the more durable trade paperback, as i'm passing my copy to george ASAP (and forcing it on jen and wabes after that). the second thing of great comfort was tucked into my groceries at the amish market yesterday: a friendly girl from TAMEF (a local turkish-american cultural group) gave me a warm takeaway container of noah's pudding, a galactially old recipe that middle easterners prepare for their neighbors. i am not a big pudding fan - tapioca in particular makes me want to crawl out of my own skin - but this stuff, wheaty and toasty and full of unexpected goodies like apricots and pine nuts, was really good. it was so good, in fact, that i'm going to make some of my own and inflict it on those of you who are within dessert range. *** when i was little and couldn't say my name, i called myself noah: coincidence? i think not. *now hosted, weirdly enough, by padma lakshmi, aka mrs. salman rushdie; she replaced katie lee joel from season 1. i feel certain that bravo will tap melinda gates for season 3. **that's what happens when you don't give people their own offices, corporate america. ***not on the actual day of ashura, mind you - i'm not sure that totally co-opting someone else's calendar is cool. "Please don't tell the supervisor I have the flu." "I myself have been working with a broken hip for the last two weeks. Haha!" - Japanese workers in The Simpsons: "Marge in Chains"
i'm fascinated with the term middlebrow. mostly because my taste gravitates pretty reliably toward things so labeled. if _js & mr n_ counts, what would be an apples-to-apples example of highbrow and of lowbrow? ah, E, that's the $64K question; jacob asked it a few years ago and hasn't yet been answered. apples-to-apples helps a bit, though: sticking to the fantasy genre, i'd say tolkien is toward the highbrow end and robert jordan is probably lowbrow (not that i didn't love the wheel of time series back in the day, mind you). if magic realism counts, i'd say murakami is definitely highbrow. if we throw sci fi in there as well, then novels in the star wars universe are lowbrow. this is slippery stuff, though, and i'd love to know what you folks think. Highbrow: John Crowley, "Little, Big"; Ursula K. LeGuin, the Earthsea trilogy? Lowbrow: anything with a chain mail bikini on the front. jonathan strange & mr norrell? check. like you, nothing i had read about it really prepared me for what it would be, and as for genre i still find it a bit slippery and hard to pin down. but i did find it a delightful surprise and on the "-brow" scale i'd put it in the upper half. i'd consider reading it again except that i bought it when it was still in hardcover and lugging that thing around on the el may have caused permanent curvature of the spine. on the norm v. gore slurfest: heh. that's like...if naomi campbell threw her cell phone at joan rivers. which side would i take? definitely low-brow (and wildly off-topic), but my favorite link of the day by far: if dali had painted angelina jolie. the whole site (gallery of the absurd) is pretty great, actually. 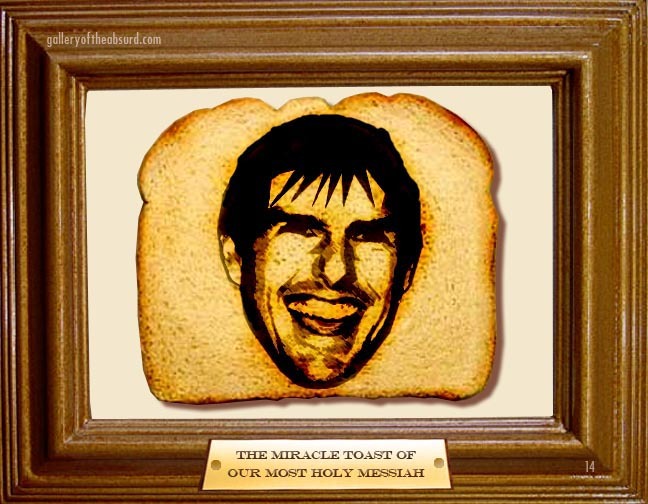 tom cruise toast. oh, yeah.